Friend is refinancing a student loan of 155,000 - check the details here or as below. Friend is a pharmacist and is planning to pay 2000/month if everything goes ok. Here are the other terms if any look more attractive. UPDATE: I learned that with this and some other vendors there is the option to switch between Fixed and Variable as well as there is always that option to refinance again. So would the advice still stand? Thus they both are on auto pay qualifying for additional auto pay benefits (0.25%?). So there will only be 2 automatic payments each month which allows to keep an eye on this. Sofy refinancing allows a few other benefits like unemployment benefits - so the loan can be paused during the unemployment duration, believe they also provide some career assistance, also can refinance it in the future to variable interest rate as well or a reduced fixed rate. With public loans the benefit is again that one can move on to a different payment plan if hardship arises, the loan forgiveness if the candidate finds a related qualifying job in public service and also I saw another benefit on certain loans that if 12 payments are made on time then there is additional interest reduction. I believe this gives the best of both the worlds for now. Thanks everyone for your assistance. You're choosing between a variable rate and a fixed rate. As such, you are basically betting whether interest rates will rise or not. You're going to pay a good bit more with the fixed rate in the short term, in exchange for surety against interest rates rising significantly in the long term. The more you'll pay off early (and shorten the time in which interest rates may potentially rise), the less at risk you are to the potential for interest rates to go up. In particular, the more you reduce the principal, the less that potentially higher interest rate might affect. One thing to consider is how much the interest rate might potentially rise per year. The terms of the loan should dictate this; typically a certain percentage would be allowed each year. Throw into your calculations the possibility of that percentage increase every year. How much would be paid out in total then? This means that, for example, if half a percentage point was the most it could increase, over ten years it might increase by five percentage points - though of course the worst of that would be on very low principal amounts, so very little impact, earlier increases will be significant. The early year negative difference is a powerful force, I would say, and that should be strongly considered. But the risk of the variable rate is not one to ignore either. Only you can make that decision, though (or in this case, your friend). This is more opinion based. It is like predicting what would happen in future. If we go with assumption that variable rates will rise by 0.5% every 2 years; then it is still recommended to go with variable. If the rates increase at faster pace, then it would make sense to go for Fixed. My view would be check if small part payments are allowed. This was even if the EMI is 1596/- per month, make the payments of 2000/- so that the loan would reduce faster thereby reducing the impact of rising rates in future. This doesn't change much the rationale used now to determine what to go with. Say one goes with Fixed Now. If the variable rate goes further down; then yes one can switch. But then again, if its gone down too fast, it can rise too fast as well; so the dilemma continues. This may also mean the fixed will go down, so one can refinance to fixed again at lower APR. If one start with Variable, the variable has gone up; then the fixed being offered at that point will also be up. So changing to fixed may not make much sense; because you can't predict if the variable will go down again or stay up. So essentially the dilemma you have today would continue. So its a pure gut / comfort factor. Do you believe the variable rates would rise fast enough or not. There are two ways to think about what is the "better" choice here: (1) thinking about what financial markets and interest rates will do over the next several years; and (2) thinking about which is more appropriate for the personal circumstances of the borrower. (2) is the right way; (1) is the wrong way. Fixed rate is the lower-variability, and hence lower-risk, option. The risk in the loan should be balanced with borrower's other financial risks-- on the earnings & other expenses side. So: What are Friend's expectations about changes in earnings over the next 6-10 years? How about changes in expenses? If Friend expects personal earnings to rise significantly with work experience, or if Friend expects to have substantial free cash flow / limited other expenses, then it may be reasonable to take the risk of a variable rate. On the other hand, if Friend expects earnings to be relatively stable/flat over time (what I might expect in a professional position but expectations could vary hugely), or if other expenses are otherwise expected to make free cash flow tight, then it would be more prudent to reduce cash flow risk, and take a fixed rate. To compare the two choices, you should compare two scenarios that are as similar as possible, and form the comparison about an amount of money at one point in time, preferably the present. 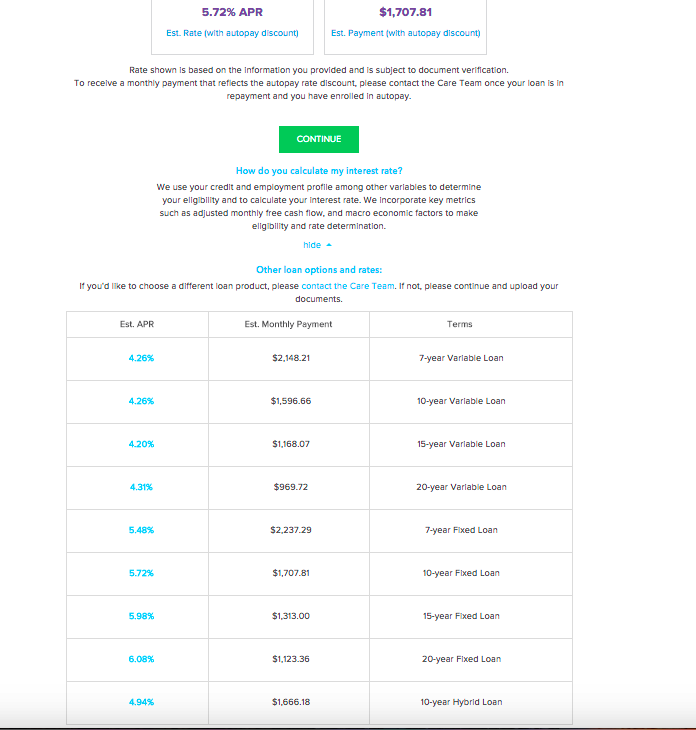 If you chose the low-interest route, you can pay of the entire debt with 90 monthly payments. Not the answer you're looking for? Browse other questions tagged united-states student-loan refinance loan-consolidation school or ask your own question. What options are there for consolidating a large amount of private student loan debt? Best strategy for paying off my multiple student loans? Is SoFi too good to be true? What are the downsides to refinancing student loans? Who can I consult about paying off my student loan? Is refinancing my auto loan just to avoid dealing with the lender that issued it a crazy idea? Should I sell investment property to pay off student loan debt and variable rate home equity line of credit?